Trade Closed: AUD/JPY Selloff to Resume? This pair resumed its selloff and came within a hairline close to my target before popping back up and hitting my adjusted stop. In my previous update, I highlighted a bearish flag formation at the middle of the descending channel, which did serve as a continuation signal. Price tumbled to the channel support I was looking at when risk-off flows stayed in play for the most part of the week. It even got another push lower when the Japanese yen rallied after the NFP release. However, the 82.00 handle held up really well as a floor. Even though price gapped down over the weekend, the pair managed to make a sharp pop higher when iron ore prices recovered. Good thing I was able to adjust my stop loss down to the 82.75 mark to lock in some gains in case this happens. Phew! To be completely honest, I’m a bit bummed out that I wasn’t able to catch more gains on this one since price already dipped to lows around 81.90. In hindsight, I probably should’ve closed early when the 82.00 handle refused to give way. But oh well, a win is a win! I’m still gonna keep an eye out for this descending channel setup because I’m counting on a bit more AUD weakness. Of course this depends on how this week’s set of catalysts play out and if risk aversion returns! Got any comdoll setups you’d like to share with me for this week? 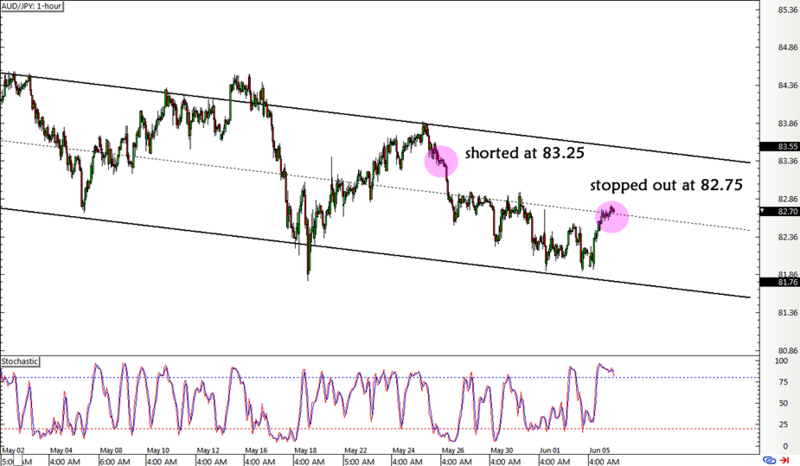 Trade Watchlist: AUD/JPY Selloff to Resume? I’m still feeling bearish on the Aussie so I’m looking at another potential short play on AUD/JPY. I’m waiting for a bit more momentum before jumping in, though. Trade Update: AUD/JPY Selloff to Resume? Now that pre-OPEC speculations are out of the way and commodities are in profit-taking mode, the Aussie could resume its slide versus the lower-yielding yen. Here are my entry levels. It looks like Aussie bears are encountering another roadblock and pausing at the mid-channel area of interest for this pair. Because of that, I’m gearing up to make these trade adjustments.